What is a Pledge Fund? A Pledge Fund is a form of private equity investmentPrivate Equity FundsPrivate equity funds are pools of capital to be invested in companies that represent an opportunity for a high rate of return. They come with a fixed investment horizon, typically ranging from 4 to 7 years, at which point the PE firm hopes to profitably exit the investment. that allows members to pursue specific investment goals by contributing funds into a particular pool. It is similar to other types of investments except that investors in a pledge fund enjoy the option of providing funds to specific investment deals. Investors provide a capital commitment to an investment teamFive Highest Paying Jobs in the Financial IndustryWe hope you enjoy this guide to the Five Highest Paying Jobs in the Financial Industry. The financial industry is easily one of the most competitive when it comes to finding a job. This is even true in regard to entry-level positions, as it’s almost entirely unheard of to build a successful career in to make investments with specific predetermined parameters. They approve each transaction, and they can decide whether to pursue each transaction independently or as a batch. A pledge fund serves to eliminate some of the pitfalls that affect traditional investment funds. Pledge funds became popular after the dot-com bubble. At the time, investors used the conventional format of investing where investors contributed funds into a single pool managed by a fund manager. The fund managerPortfolio ManagerPortfolio managers manage investment portfolios using a six-step portfolio management process. Learn exactly what does a portfolio manager do in this guide. Portfolio managers are professionals who manage investment portfolios, with the goal of achieving their clients’ investment objectives. would then invest in portfolios that the group decided on, rather than what each investor was interested in. The pledge fund format allows investors to select whether to take part in an investment opportunity on a deal-by-deal basis. The format is preferred by investors who are skeptical about investing in sectors they are not familiar with. Pledge funds are created to pursue investments in a variety of industries and sectors that achieve a higher rate of return, such as real estate and energy. The funds are run by a team of experienced angel investors, either former VCs or current VCs. The team members serve as the General Partners and they handle the admin functions of the fund. Some of the functions include sourcing, vetting and pitching investment ideas to the pledge fund investors, preparing legal documents, outreach and handing post-investment support to ensure that the investments are running smoothly. 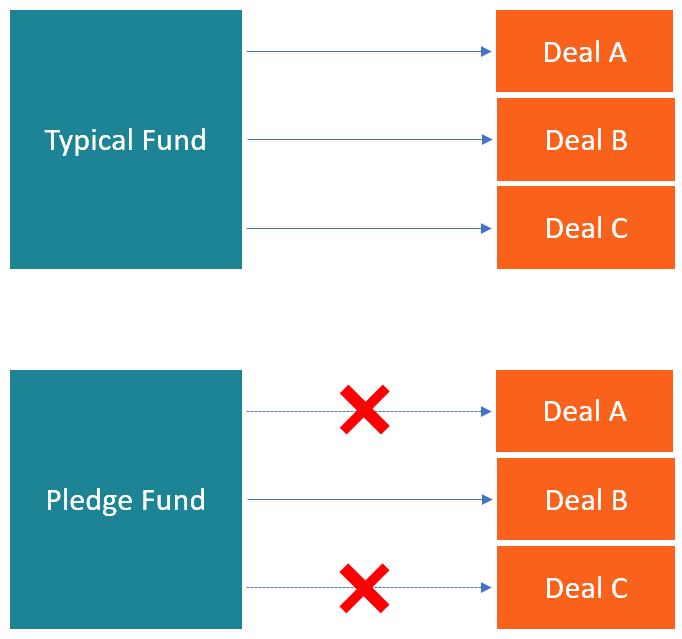 Unlike conventional venture funds, a pledge fund does not operate a blind pool. Instead, it funds investment opportunities, vets them, and presents them to investors. The pledge fund investors then review the deals given to them and decide on which deals to invest in. The practice is different from the traditional venture fund format where investors enjoy limited input into what investments opportunities to invest in and the daily operation of the fund. A pledge fund offers a considerable amount of control over how and where investments are made. Each pledge fund includes a deals review committee that scrutinizes the monthly deal submissions to get the most promising deals. Ideally, the committee meets with high-growth companies, conducts a preliminary due diligence processDue Diligence ChecklistThis example due diligence checklist for corporate transactions should be completed for real deals and is an example checklist from an investment bank and selects the top deals that are within the investment bracket of the investors. The committee then prepares executive summaries of each deal and sends them to the fund investors. Investors are given a window within which to review the deals and respond back to the funds’ general partners with the deals they are interested in. The deal review period may take several days to a few weeks. The general partners then go ahead and make the investments identified by the investors. If there are instances when the investor’s pools can be combined to invest in one company, the general partners tend to create a separate limited partnership to invest in that particular company. The investors are then listed in the new entity as limited partners. Even with the benefits that pledge funds enjoy, there are also drawbacks that may make them less attractive compared to traditional investment methods. One of these limitations is that investors will need extra time to vet and determine whether to invest their funds into a certain deal or not. It affects the efficiency of the fund since some of the deals require swift actions due to time limitations. In traditional fund formats, fund managers make these decisions without necessarily waiting for the input of investors. This allows them to close deals more quickly while pledge funds are still screening investment opportunities. Most pledge funds put in place a less rigorous admission process for new investors. The basic step of becoming a member is to complete an investor questionnaire that requires the investor’s details, investment profile, size of their investments, and other details that are specific to various pledge funds. The questionnaire and the accreditation requirements are required to determine the investor’s history of investments, preferred investment portfolios, and their risk tolerance levels. After investors are admitted to the pledge fund, they are required to pay annual management fees. Typically, the fee ranges from $5,000 to $10,000 per year and can sometimes go higher, depending on the firm. The fee is used to cover basic administrative costs and operating expenses, and to weed out investors who are not committed to making seed stage investments. The argument here is that if a prospective investor can pay such an annual fee, they should be in a position to make $100,000 to $500,000 in angel investments of their choice. Members who earlier paid the annual management fee are usually granted access to the pledge fund’s deal flow. A pledge fund offers the advantage of putting investment decisions in the hands of individual investors, rather than forcing investors to invest in ideas that the majority want to invest in. If the majority of investors choose to invest in a single portfolio, investors who are not interested in the investment can decide to stay away and invest in a different pool. On the other hand, blind pools are a type of private equity funds where investors contribute to a fund and the fund manager is tasked with identifying, vetting, and choosing what and when investments are made. Investors who contribute to the fund lack input into the fund since fund managers make the investment decisions. Blind pool funds were more popular in the 1980s and 1990s, but investors started avoiding them after the dot-com bubble. Pledge funds give the investors the freedom to choose the type of deals to invest in, something that was lacking in blind pool funds. Private Equity vs Hedge FundPrivate Equity vs Hedge FundCompare private equity vs hedge fund in terms of investors, risk, liquidity, time horizon, compensation structure, careers and more pros and cons of each. There are several important points to know about the similarities and differences of private equity vs hedge fund.